"This book is a reference and guide to the Directorate General of EBTKE,c.q the Bioenergy Directorate, in monitoring and evaluating the implementation of Occupational Health and Environmental Safety (K3L) in biogas installations based on palm oil liquid waste," said Biogas Director Andriah Feby Misna representing the Director General of EBTKE during the book launch at the Indonesia Kempinski Jakarta Hotel , Thursday (3/28). Feby revealed that this book would be a reference for related stakeholders in conducting K3L supervision. So that it can improve the safety services and health of workers in the Biogas industry. She also did not forget to thank the Deutsche Gesellschaft fur Internationale Zusammenarbeit (GIZ) who participated in the preparation of the book. 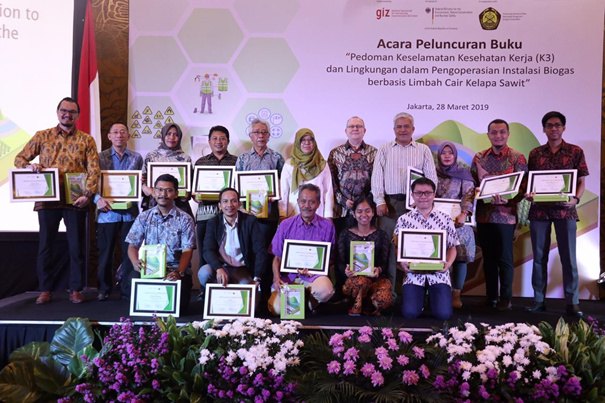 "Thank you to GIZ for its great contribution in supporting the development of EBT in Indonesia, all stakeholders who have contributed to the preparation of this guideline," she said. This handbook is one of the outputs of the implementation of the Strategic Exploration of Economic Mitigation Potential through Renewables (ExploRE) Project which is a technical cooperation activity between the Government of Indonesia through the Directorate General of EBTKE and GIZ in the field of renewable energy. "Starting from the end of 2017 by the Bioenergy Directorate as a K3 guideline benchmark. Then it was followed up in 2018 through cooperation with GIZ," Feby said. d) Chapter 4 Monitoring and Testing of Safety and Environment. The use of palm oil liquid waste or commonly called POME (Palm Oil Mill Effluent) itself is a raw material for PLTBg. 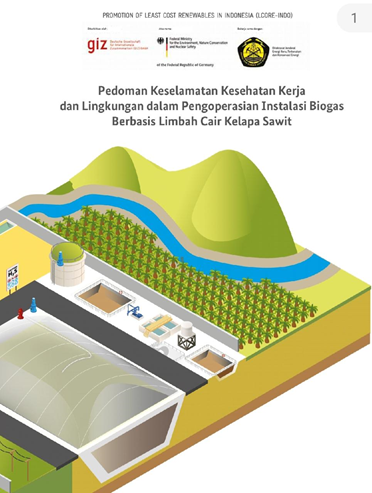 To date there are more than 50 (fifty) biogas installations based on palm oil waste operating in Indonesia. "POME provides multiple benefits, in addition to producing electricity, it also has a positive impact on the environment, namely utilizing waste while reducing greenhouse gases," said Feby.